CHICAGO--(BUSINESS WIRE)-- Hyatt Hotels Corporation (NYSE:H) announced today the opening of Hyatt Centric Gran Via Madrid. The 159-room hotel is located in the heart of Madrid along the vibrant Gran Vía. As the first Hyatt Centric hotel in Spain, Hyatt Centric Gran Via Madrid boasts an unbeatable location designed to be a launch pad for sightseeing, tasting and experiencing everything the capital city has to offer. The hotel is just minutes from the famous El Retiro Park, Prado museum, Royal Palace and many boutique shops. The hotel’s contemporary guestrooms and suites are stylishly decorated and infused with local flare. Each suite offer city views and spacious furnished terraces. The hotel’s restaurant and bar, Hielo y Carbon, offers handcrafted signature cocktails and locally inspired fare along with an authentic mix of crudos and grilled dishes. The hotel features one of the most spectacular rooftop terraces in Madrid where guests will be able to experience unparalleled views of the ornate Gran Vía. 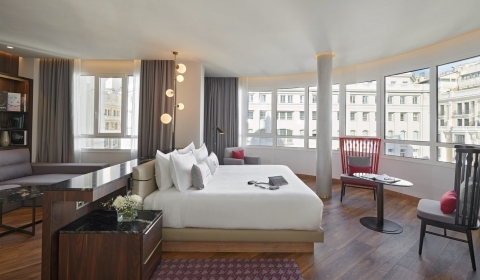 The hotel has 159 guestrooms including: seven junior suites; five executive suites; two terrace suites; and one Fenix Suite and Presidential Suite overlooking the Gran Vía. Each guestroom has complimentary Wi-Fi, a 55-inch-flat-screen TV, individually controlled air-conditioning and an electronic safe. The hotel boasts three dining options: Hielo Y Carbon, Ondas: Vermuteria + Lounge, and Via Fantastica. In the Hielo Y Carbon restaurant, guests can experience a sophisticated and unique mix of local delicacies. The restaurant features a hot charcoal kitchen serving local meats and the Crudo Bar invites guests to try crafted cocktails, regional wines and beers from the Ginoteca. The modern Ondas: Vermuteria + Lounge serves all-day tapas and cocktails along with hot and cold snacks, tea, coffee, barrel-aged cocktails, vermouth on-tap, wine and beer. Via Fantastica is the hotel’s rooftop bar that overlooks the city and offers a relaxing atmosphere. The fitness center is open 24 hours a day and is equipped with state-of-the-art cardio equipment and free weights. Other services available include restaurant-to-go service, full-service concierge, multilingual staff as well as laundry and dry cleaning services to fulfill every need. For more information, please visit https://granviamadrid.centric.hyatt.com.